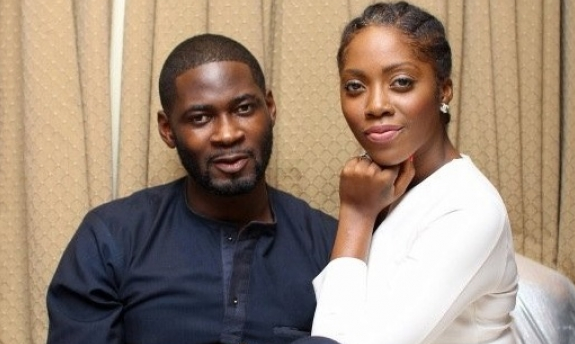 On September 27, 2014, YNaija reported that Tiwa Savage and TeeBillz were having marital issues – 6 months into their much publicised wedding. At the time, Tiwa was spotted, unusually alone at events, and she was also late in sending birthday wishes to her estranged husband. Those were the initial red flags we noticed, hence we went digging for more information. On September 29, 2014, we confirmed these rumours through inside sources who revealed that the Mavin singer was about to quit the marriage as a result of his infidelity and his incessant physical violence – which had been happening even before the marriage. On the same day, we published a second report, revealing that she had fired TeeBillz and hired a certain Mekka Millions, a protégé of her husband, to take over as her manager. In our exclusive report of September 30, 2014, we revealed that Tiwa Savage had moved away from their matrimonial residence. To assure the world that all was well with their union, the 323 Entertainment boss then put up on Instagram, a photo of his wife, Tiwa Savage, celebrating her as his ‘Woman Crush Wednesday’. The singer acknowledged the gesture by replying with a ‘All Day Everyday’ comment. On October 5, 2014, Tiwa Savage granted her first official interview since reports of marital troubles surfaced. The interview was on Olisa Adibua’s The Truth but she shied away from questions about her marriage. And while it appeared the marriage was finally peaceful, later that month, rumours surfaced from the grapevine that top Lagos politician Folorunsho Folarin-Coker was dating Tiwa Savage, but all parties involved dispelled the rumours. At the turn of the new year – January 1, 2015 – the couple announced they are expecting their first child. They seemed closer than ever when on April 26, 2015 – Tiwa Savage and TeeBillz marked their wedding anniversary with loving messages. In July of the same year, their marriage – to the outside world – was blossoming stronger than ever, as the couple welcomed their son – Jamil. Although the couple chose to hide the identity of their son for a few months, on Christmas Day – December 2015 – they finally unveiled Jamil’s face to the world. Between January to March 2016, things were quiet at the home front while Tiwa Savage sought to return to work. During that time, the singer and her baby boy were unveiled as ambassadors of baby care products giant – Pampers. TeeBillz was absent during the unveiling, but he posted a picture from the ceremony on Instagram. By March 1, Tiwa Savage posted online, pictures from a work trip to Jamaica and she would subsequently reveal that she had suffered a miscarriage. Twice in March, TeeBillz threw caution to the wind by fighting fans of Tiwa Savage on Instagram. On April 27, Tiwa Savage released the video for her second single – If I start to Talk – where she subtly addressed domestic violence by showing a couple of suggestive visuals depicting women being battered by men. A day after the video was released, TeeBillz suffered a meltdown as he lashed out at Tiwa and also attempted to jump off the Lekki-Ikoyi link bridge.